With our very first selection, we decided we really needed to stick our necks out and dig up from the vaults a piece of music that truly exemplifies the Abstract sound - something special, something that defies any easy form of categorisation, something that stands out in the crowd, makes a bold statement and stops you dead in your tracks in much the same way as being slapped squarely in the face with a fresh halibut. 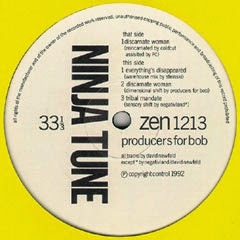 One of Ninja tunes earliest releases - now some twenty plus years of age, relatively obscure (at time of writing, we could find one youtube post of this track, with 700 views), with absolutely zero commercial appeal and weighing in with a hefty running time of close to 12 minutes, this masterpiece is not exactly dance-floor friendly (unless you know what you're doing and already have the crowd in the palm of you hand). It's a track in three parts - the first being on a cool house tip, with mellow synth stabs in a leisurely early balearic style. This then breaks down into an absolutely blistering slice of ravey breakbeat/techno, before finally meandering off into ambient trip-hoppy noodleness in the coda. Appearing all the way through are little snippets culled from "Bob's Talk Show", a bi-product of the somewhat off-kilter world of Bob Dobbs and the Church of the SubGenius. Why have we chosen this little stunner, out of thousands, to be AbstractRadio's first ever tune of the week? It's not even close to being the greatest piece of music ever written (fyi: they were all composed hundreds of years ago by guys in high collars and wigs). It's probably not even the Ninja crew's finest hour - there are quite a few contenders for that title, many of which will no doubt be future tunes of the week. So why then? Very simply, it's an ever-so-crazy show-stopping work of pure genius, that's why. What makes it so special to us here at AbstractRadio? It represents the almost limitless possibilities of modern music: it's not about house, breakbeat, ambient, jazz, soul or techno, it's all of these things. It's about breaking out of the mould of pigeon-holing, categorising and compartmentalizing the world into nice, neat, antiseptic, easy-to-digest packages. It's about resisting the all-encompassing and soul destroying homogenisation that is becoming the norm of our modern existence. Thank you Matt, Jon and Patrick, for being big and boundless.